1994 the tag team of kung-fu crazed rapper and the most influential Hip-Hop producer of all time came together to produced one of the best loved and most inspired alums of Hip-Hop’s 90’s golden age. The rapper was Brooklyn’s own Jeru The Damaja, the producer the incomparable king of boom-bap DJ Premier and the album was ‘The Sun Rises In The East’. Having come to fans attention through his feature of ‘I’m The Man’ on Gang Starr’s 1992 “Dailey Operation’ anticipation for this debut album was high and didn’t disappoint. With solid underground classics like ‘Come Clean’ and ‘Can’t Stop The Prophet’ tearing up the radio and the clubs this album was set for greatness. 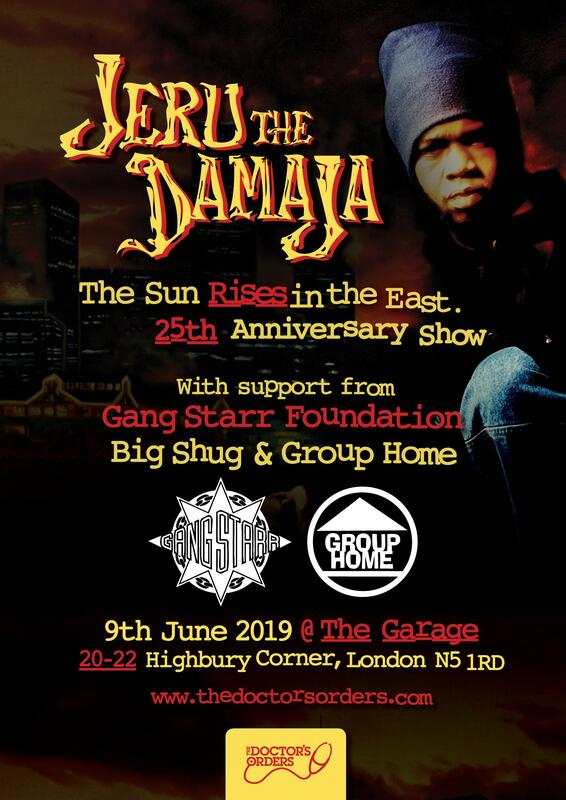 Join Jeru alongside other DJ Premier affiliates Gang Starr Foundation and Group Home performing the classic ‘Livin Proof’ to celebrate the 25th Anniversary of this classic album live in London.